I just got back from our yearly staff retreat. This year we went to the East Sea area in Korea for 3 days and 2 nights. I was very excited to be at the beach, but once we got there it was raining non-stop and we were expecting a possible typhoon. Well luckily I don’t think we were hit with a typhoon and we did get some sunnier weather on the last day there. Some of the purposes of our retreat was to build community within our faculty, as we have many new teachers this year. Also, we revisited our school wide expectations and came up with new goals to focus on for the school year. As I reflect back on the retreat, it made me think about my classroom. The first few weeks of school are such a critical time in setting up the environment, expectations and goals for the year. The retreat reminded me the importance of really making an effort to build community during the first few weeks of school in my classroom. There’s an activity that we’ve been doing at our staff retreats that I’ve adjusted and incorporated into my first week of school. 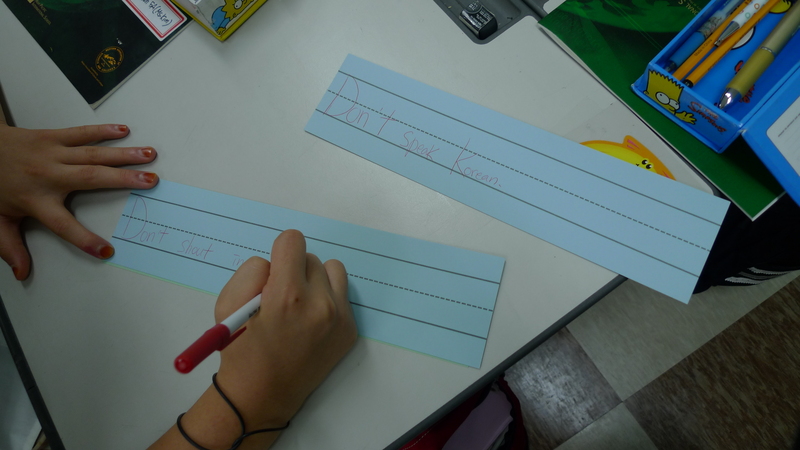 On long strips of construction paper (you can cut sentence strips in half), I have students write their expectations/rules for a classroom. They write one expectation on each strip. 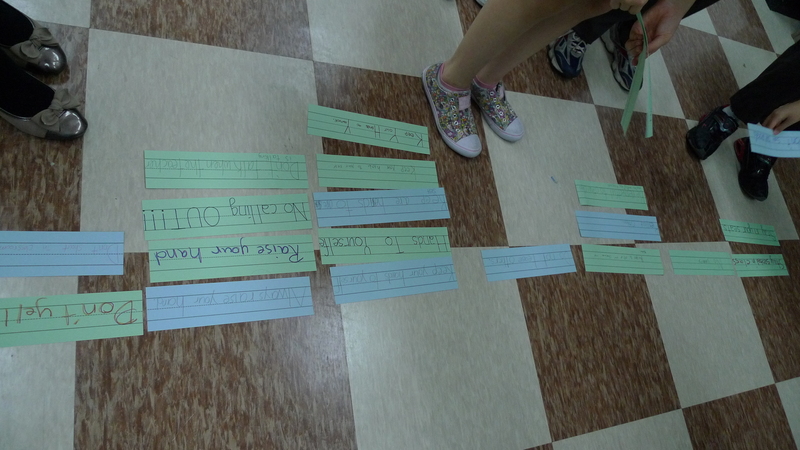 Then, I have them place the strips on the floor and students group the ones that are similar in the same column. After, we sit together in the rug area and I write on chart paper the expectations we have come up with. 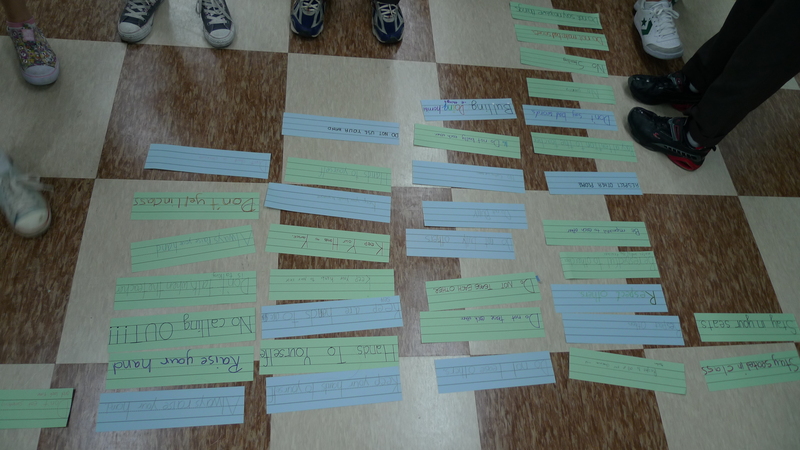 Then we do some brainstorming and combining to come up with a set of classroom expectations that we all agree upon. I write up neatly a final copy on a new sheet of chart paper and they each have to sign it. I find this an effective way to come up with expectations instead of just telling students these are the rules, you must follow them. This way, they have a greater sense of ownership of the classroom expectations. I will try to post some photos when I do this activity with my students this year. *Edit* Here are some photos from doing the activity with my students a few days ago!